Although the U.S. economy has recovered from the recession sooner than predicted, many people still cannot afford to buy a home. With affordable housing alternatives remaining out of reach for many hard-working Americans, tiny homes have become a creative response to the affordable housing crisis. Given the rising popularity of these homes, it’s no surprise that increasing numbers of builders, including manufactured home builders, have started to offer various tiny home designs. Using standardized and improved manufacturing processes, manufactured home builders can provide high-quality, durable tiny homes that meet the latest construction, energy, and safety requirements. If you intend to buy a tiny home anytime soon, it’s important that you familiarize yourself with this industry sector, the laws of your state, and how they apply to these types of homes. Here are some general guidelines and tips to help you make the most of your investment. There are two main categories of tiny homes: 1) tiny homes on wheels (also referred to as THOWs or RVs), which can serve as temporary housing; 2) tiny homes that can be placed on permanent HUD-approved foundations and classified as real property. Local governments can (and often do) impose specific installation requirements. The building permit is one of them. A building permit may be required for the installation of a tiny home, either on a private or rented lot. Before deciding whether you want a tiny house on wheels or on a foundation, it’s important to know that some states limit the length of time an RV can remain on a lot. Conversely, factory-built homes that are placed on permanent foundations must comply with the HUD’s installation standards and local building codes. Since building codes are constantly being updated, a professional builder should stay up-to-date on frequent code changes. Furthermore, the builder should design and build each home for its specific location. For instance, if you intend to place your tiny home in a “wind zone” or in a flood-prone area, the builder must comply with the structural design requirements of building codes. Utility installation and connection is typically subject to the requirements of the local housing authority and/or utility companies. Failing to understand all the requirements could result in time-consuming rectifications later on and additional costs. So, you’re dreaming of tiny-home living away from neighbors, traffic, and noise. But one thing you should know is that you just can’t plunk down your home anywhere you want. The categories and location of factory-built homes are currently regulated by municipalities, based on their own development plans. As these plans must give proper regard to affordable housing needs, most states make available different opportunities for the establishment of factory-built housing. 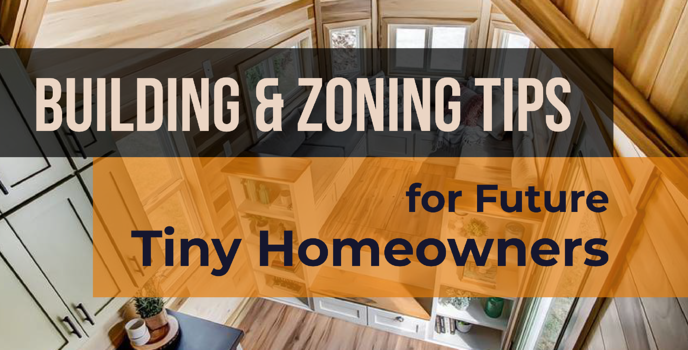 Before you site your tiny home on rented or private property, make sure you review your local zoning codes.To make sure you aren’t violating any laws by having a tiny home on your site, you can also discuss your plans with the local zoning board of appeals. Empowered by the municipality, this board decides on a case-by-case basis whether a particular home can be placed on a private rental lot, on land the buyer already owns or intends to buy, or in a land-lease community. To ensure that the home you intend to purchase will be approved in a certain district, it must meet a series of architectural and structural standards. As an example, factory-built homes are required to have a permanent foundation, skirting around the underside, a minimum roof pitch, and specific roofing and exterior siding materials. The homes that don’t meet all the requirements won’t be approved in particular residential zones, even if they comply with local building codes. Before investing in a tiny home, be sure to check the minimum habitable floor space as well. The minimum square footage of living space commonly required by municipalities often excludes tiny homes and single-wide manufactured homes from conventional communities. On the bright side, some communities don’t have any size requirements for tiny homes, as long as they meet building codes. Currently, the zoning laws for factory-built construction, including tiny homes and manufactured homes, are being actively criticized by industry advocates. In response, several federal agencies are considering the development of revised rules that would extend the availability of affordable housing alternatives to a broader pool of consumers.